Megan Keathley ("Gloria") and Rob harris ("Bernard").Photo by Garry Bastian Photography. The folks at Twilight Theater Company never fail to surprise – after a string of intense, quirky, and sometimes cheerfully tasteless shows, they fly back into the fall season with playwright Marc Camoletti’s Boeing Boeing, a classic French farce that loses nothing in translation and keeps the passengers/audience robustly entertained. The show won the 2008 Tony award for “Best Revival of a Play” – and having seen the Twilight version it’s easy understand why. It’s smartly written, fast-paced, and the humor is in no way dated. This is director Matt Gibson’s first production in Portland, but most certainly not his last. The set-up is revealed before the first actor comes on stage – the airline theme broadcast by a recorded pre-show announcement that mimics pre-takeoff instructions, the potential for horseplay obvious from the single set with six doors. We just know that there will be a lot of coming and going and lots of close calls to justify that many portals! The story? Swinging American bachelor Bernard has a spiffy pad in Paris, in which he serially entertains three lovely airline hostesses/fiancées. With the assistance of Berthe the maid, he’s able to juggle the three by studying the airline timetables to ensure that their visits never overlap. Of course it’s too good to last; the introduction of newer, faster planes means that each woman’s travel time is shortened, and inevitably they find themselves all in Paris at the same time. The catastrophe comes soon after the arrival of Bernard’s friend Robert, an unsophisticated Midwesterner whose presence first ameliorates, later complicates, the situation. Boeing Boeing is one of those satisfying shows where each member of the small (six person) cast is critical to the plot. That can make casting a special challenge, but Gibson has assembled a group of adept comedians (four new to the Twilight stage) who do complete justice to the split-second timing and lavish physical comedy required by the script. Megan Keathley (“Gloria”) is beautiful in the pushy, domineering style of an “Ugly American” – she delivers her lines with an abrasive chauvinism accented by consistent disdain for all things French. Erin Bickler is a marvel as the Italian “Gabriella,” particularly to anyone who saw her earlier this year playing Tracy Lord in Philadelphia Story. Had it not been for the program, I wouldn’t have recognized her as the same actor – it was like seeing Katherine Hepburn suddenly transformed into a combination of Sophia Loren and Charo. Jenny Newbry’s German “Gretchen” is perhaps the most charming of the three hostesses – while she is appropriately argumentative bringing a Teutonic directness to her delivery, she resists the urge to play the part of a stereotypical uber-Kraut. Her amazingly cute face goes a long way toward softening her Germanic quirks, and her pigtails are more “little girl” than Hitler Youth. Rob Harris has the nominal lead as “Bernard,” and he makes the most of some great material. Harris hilariously traverses the path from suave womanizer to hysterical mess as his chickens come home to simultaneously roost, and the scenes where he explains the merits of his foolproof system to old friend Robert (Zero Feeney) provide exposition without seeming expository – not an easy feat. 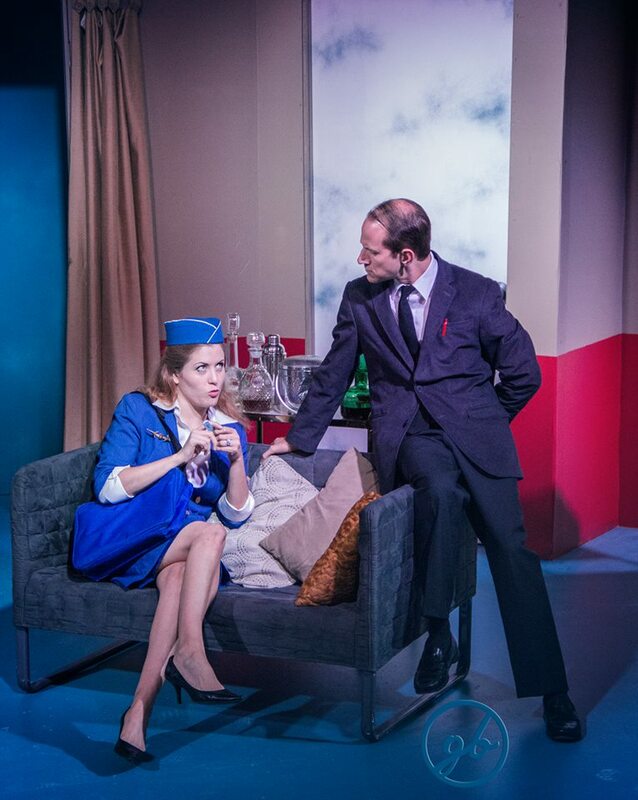 However, it is Feeney and Amanda Clark (as “Berthe”) who really steal the show. Feeney brings a blend of baffled naivety, sincerity, and near-adolescent eager sexuality to his role, and his timing and delivery could not be better. “Berthe” is the role Clark was born to play – the small theater’s intimate setting is the perfect canvas for her incredibly large and mobile eyes, and she unfailingly adheres to her French disdain for the houseful of idiotic foreigners – with a special dose of contempt for Gloria’s all-too-American arrogance. Costume Designers Chris Byrne and Mikaela Gladstone have done an exquisite job of capturing authentic ‘60s style. The longer skirts, carefully tailored jackets, perky hats, matching bags, and bright color-coding of each hostess are particularly effective in capturing the fashion spirit of the era. The clothing suggests an apparent societal and sexual interchangeability among the three women that turns out to be quite misleading – despite their bright smiles and tight bodies, these are not Stepford Stewardesses! Boeing Boeing is one of the funniest shows I’ve seen this year, and definitely merits the large audience and larger laughs I heard at Friday’s show. There are only two more performances, so get your tickets now! Twilight Theater Company’s Boeing Boeing is playing at the Performing Arts Theater, 7515 N. Brandon Avenue, Portland through Saturday, September 24th with performances at 8 P.M. Friday and Saturday. TEA FOR THREE - 3 SHOWS ONLY!